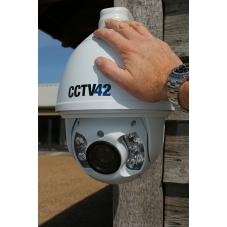 PTZ cameras allow you to remotely move the camera and zoom in or out. The cameras can be controlled via your DVR recorder and you can also move the cameras when accessing your CCTV system remotely using a PC, Mac, phone or tablet. Our PTZ camera is full HD 1080P resolution and has built in IR infra red lighting allowing it to be used at night as well as during the daytime. If you need help in choosing which CCTV camera is best for your application we have a CCTV camera buying guide or your can call us on the phone or send over an email. We are always happy to offer advice if you have a specific project in mind. The PTZ cameras are out of stock at the moment and will be returning soon. Control this camera using any of our DVR recorders. Using the DVR allows you to remotely control the movement of the camera from a computer, iPad or mobile phone form anywhere in the world. The other way to control the movement is via a PTZ joystick controller. This is particularly good if you are on site and want to be able to quickly and easily move the camera around or zoom in and out. Pan / Scan speed is adjustable. Tilt speed is also adjustable. The cameras have a choice of up to 256 identity numbers for use on multiple camera systems. Pre-set points can be programmed into the camera and these also include zoom levels. As with all our cameras power and video connection is via industry standard DC and BNC connectors respectively and any of the camera to DVR leads will work with this camera.